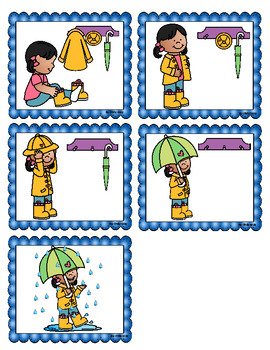 Fun activity to encourage your students to write a narrative in which they recount two or more sequenced events including some details and time order words. 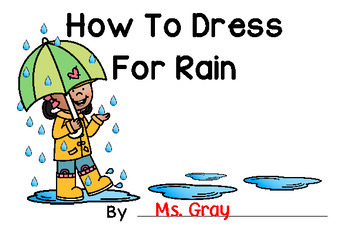 Included are the pages needed tor students to write their own How to Dress For Rain book. I've included two versions of the book. 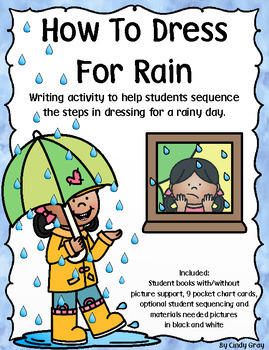 The first version has picture support on the pages to help the student sequence their writing. The second version has no picture support. The students will be in charge of their own pictures to support their writing. 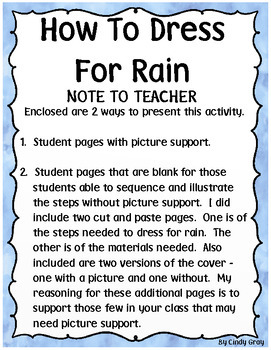 I did include student cut and paste pages of the materials needed and sequencing steps for those few students who may need help with picture support as well as picture support for the cover. Also included are individual picture cards to use in a pocket chart if you wish. One set for materials needed and one set for sequencing. Please click on the preview to see the two versions of the book and the pocket chart picture cards. Click HERE for student resources to help your students work independently. Don't forget to follow my store so you'll be notified of new or free products as they are made available.